گنجی خرم دل, ناصر, کیخایی, فاطمه, مردیان, مهدی. (777). طراحی و توسعه شبکه پایش سطح آب زیرزمینی با استفاده از زمین آمار و روش های آماری در دشت اراک. مجله ژئوفیزیک ایران, 9(3), 17-29. ناصر گنجی خرم دل; فاطمه کیخایی; مهدی مردیان. "طراحی و توسعه شبکه پایش سطح آب زیرزمینی با استفاده از زمین آمار و روش های آماری در دشت اراک". مجله ژئوفیزیک ایران, 9, 3, 777, 17-29. گنجی خرم دل, ناصر, کیخایی, فاطمه, مردیان, مهدی. (777). 'طراحی و توسعه شبکه پایش سطح آب زیرزمینی با استفاده از زمین آمار و روش های آماری در دشت اراک', مجله ژئوفیزیک ایران, 9(3), pp. 17-29. گنجی خرم دل, ناصر, کیخایی, فاطمه, مردیان, مهدی. طراحی و توسعه شبکه پایش سطح آب زیرزمینی با استفاده از زمین آمار و روش های آماری در دشت اراک. 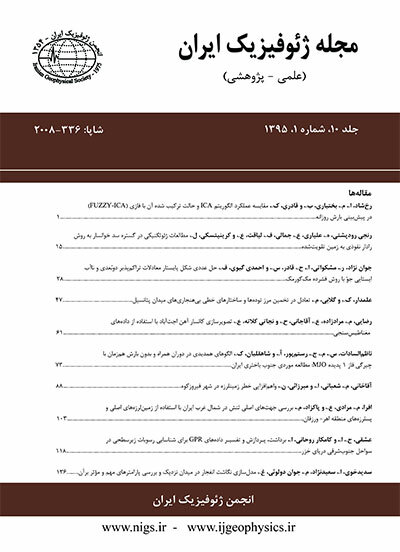 مجله ژئوفیزیک ایران, 777; 9(3): 17-29. امروزه مدلهای برآوردگر سطح آب زیرزمینی در امر توسعه و تأمین آب کشاورزی و مدیریت آن نقش مهمی ایفا میکنند. به علت اینکه میزان دقت مدلهای برآوردگر در ارتباط با تعداد دادههای اندازهگیریشده نیز هست، باید یک فرایند بهینهسازی به منظور دستیابی به تعداد دادههای مناسب همانند تعداد شبکه چاههای مشاهدهای داشت. هدف از این تحقیق، عرضه روشی برای بررسی کفایت شبکه چاههای مشاهدهای سطح آب زیرزمینی دشت اراک براساس تحلیلگر زمین آماری کریجینگ و ارزیابی نتایج آن با روشهای آماری است. بدین منظور ابتدا با روش زمین آمار کریجینگ معمولی، نیمپراشنمای تجربی برای 45 داده سطح آب زیرزمینی در دشت اراک تهیه شد. سپس به منظور تشریح میزان پتانسیل بهبود کیفیت شبکه مشاهدهای و ارزیابی دقت و صحت برآوردها، سه تحلیل آماری شامل برآورد خطای میان یابی، ارزیابی متقابل و تغییرپذیری با زمان به کار گرفته شد. مطابق با نتایج، می توان 5 چاه از میانه دشت اراک را از شبکه پایش حذف کرد؛ درحالی که در 5 نقطه دیگر، عمدتاً در شرق و شمال شرق، نیاز به چاه است. همچنین با توجه به تحلیل وردش زمانی صورت گرفته، در 10 چاه مشاهدهای، نیازی به اندازهگیری با مقیاس زمانی کوتاه نیست و اندازهگیری- هایی در مقیاس فصلی نیز برای پایش سطح آب زیرزمینی کفایت میکند. Nowadays, groundwater level estimator models have important roles in development and management of water supplies for agriculture. The analysis of the data obtained from quality and quantity monitoring of groundwater resources is related to the environmental factors and spatial continuous variation is an important common characteristic. For a quantitative description of the distribution patterns of the environmental variables, in addition to the determination of the amount of factor, geographical location of the observations data must be considered. Since the accuracy of the estimator models depends on the quantity of the measured input data, an optimization process is necessary to provide an adequate number of data points like the monitoring wells. Therefore, it is necessary to design and develop a monitoring network in the management programs of groundwater resources. The results of various studies have shown that making use of a geostatistic technique, especially the Kriging method, the groundwater resources could be predicted and monitored with a good performance. Also, the distribution conditions of the observation data and its adequacy can be studied with this method. However, monitoring investigation in Iranian watersheds has been carried out extensively. The subject is very important because in those country plains that are fertile and have the potential to grow various crops depending on the climate, the groundwater level monitoring networks must be well managed. Arak unchained aquifer with an area of 1946 square kilometers has 1458 deep wells and 1554 semi-deep wells. The purpose of this research was to prepare a methodology to investigate on the adequacy of groundwater level monitoring wells in the Arak Plain using the Kriging geostatistical method and the evaluate its advantages with respect to statistical methods. To analyse the data, 45 wells were selected from the Arak Plain. First, Kolmogorov-Smirnov test was carried out for data normality. Then, the best semivariogram of the Kriging method was determined based on R2 and RSS. For accuracy evaluation of the monitoring network model, statistical analysis m,measures including the interpolation error, cross validation, and time variation. According to results of R2 and RSS, an experimental variogram in the kriging method was best model. Also, nugget/sill is 0.22 that indicated spatial correlation was high. Based on the interpolation error, in borders of the Arak plain, uncertainty was high due to the lack of observation data. It indicates that the monitoring network needs further development to make it denser in this regions. Based on cross validation, in wells 6, 29, 35 and 36, the difference between observation and estimation data is high, showing that uncertainty in those regions has increased. Therefore, observation data in those regions are important and more wells are necessary. Because Meyghan wetland is located in the center plain, management programs should be considered in monitoring network. It is possible to eliminate 5 observation wells from the middle of the Arak plain, while 5 other wells are needed in the east and northeast of the region. Also, time variation analysis showed that in 10 monitoring wells, short time scale measurement is not needed and it suffices to carry out seasonal scale estimates for groundwater level monitoring. اختری، ر.، مهدیان، م. ح.، مرید، س.، 1385، تحلیل مکانی شاخص­های خشکسالی SPI و EDI در استان تهران، مجله تحقیقات منابع آب ایران، 2(3)، 27-39. باقری بداغ آبادی، م.، امینی فسخودی، ع.، اسفندیارپور، ع.، 1384، پهنه­بندی شوری خاک به منظور کاربری محیطی فضای سبز با استفاده از تکنیک AHP و اصول زمین آماری (جزیره کیش)، مجله پژوهشی علوم انسانی، 22(1)، 101-116. جلالی، ق.، طهرانی، م.م.، برومند، ن.، سنجری، ص.، 1392، مقایسه روش­های زمین آمار در تهیه نقشه پراکنش مکانی برخی عناصر غذایی در شرق استان مازندران، مجله پژوهش­های خاک (علوم خاک و آب)، 27(2)، 195-204. حسنی پاک، ع.، 1377، زمین آمار (ژئواستاتیستیک)، انتشارات داتشگاه تهران. خیری، ه.، 1389، گزارش نهایی بهینه­سازی شبکه پایش آب زیرزمینی با استفاده از روش‌های زمین آماری (مطالعه موردی دشت قائمشهر-جویبار)، شرکت سهامی آب منطقه­ای مازندران. دیانی، م.، محمدی، ج.، نادری، م.، 1388، تجزیه و تحلیل زمین آماری غلظت سرب، روی و کادمیم در خاک­های حومه سپاهان شهر واقع در جنوب اصفهان، نشریه آب و خاک (علوم و صنایع کشاورزی)، 23(4)، 67-76. شرکت مدیریت منابع آب، 1384، دستورالعمل رفتارسنجی کمی آب­های زیرزمینی، وزارت نیرو. شرکت مدیریت منابع آب، 1390، پیش­نویس دستورالعمل پایش کیفیت آب­های زیرزمینی، وزارت نیرو. کایدانی، م.، دلبری، م.، 1391، پهنه­بندی شوری خاک و ارزیابی ریسک شوری در منطقه میانکنگی (سیستان) با استفاده از روش­های زمین آماری. علوم و مهندسی آبیاری (مجله علمی کشاورزی)، 35(1)، 49-59. محمدی قلعه­نی، م.، ابراهیمی، ک.، عراقی نژاد، ش.، 1390، ارزیابی کمی و کیفی منابع آب زیرزمینی (مطالعه موردی: آبخوان­های ساوه و اراک)، مجله دانش آب و خاک، 21(2)، 93-108. مهندسین مشاور قدس نیرو، 1383، مطالعات کیفی و آلودگی محدوده مطالعاتی دشت اراک، گزارش هیدرولوژی، جلد دوم، سازمان آب منطقه­ای تهران. نیک­بخت، ج.، محمدی، ک.، احتشامی، م.، 1386، برآورد تبخیر- تعرق واقعی گیاه در سطح احتمالاتی متفاوت: مطالعه موردی در مراغه، آذربایجان شرقی، مجله علمی- پژوهشی علوم کشاورزی، 13(1): 95-106. Ahmed, S., Kumar, A.N., and Perrin, J., 2008, Optimizing groundwater monitoring network in highly heterogeneous aquifers using geostatistics: technique development with a few case studies: The 3rd International Conference on Water Resources and Arid Environments and the 1st Arab Water Forum. Bhat, S., Motz, L., Pathak, C., and Kuebler, L., 2012, Designing a groundwater-level monitoring network using geostatistics: A case study for south and central Florida, USA: World environmental and water resources congress, 48-58. Bouma, J., Booltink, H.W.G., and Finke, P.A., 1996, Use of soil survey data for modeling solute transport in the Vadoze: J. Environ. Qual. 25, 519-526. Caeiro, S., Painho, M., Goovaerts, P., Costa, H., and Sousa, S., 2003, Spatial sampling design for sediment quality assessment in estuaries: Environmental Modeling & Software, 18, 853–859. Desbarats, A.J., Logan, C.E., Hinton, M.J., and Sharpe, D.R., 2002., On the Kriging of water table elevations using collateral information from a digital elevation model: Journal of Hydrology, 255, 25–38. Geostatistical Analyst Tutorial, 2010, Esri All rights reserved. Gundogdu, K.S. and Guney, I., 2007, Spatial analyses of groundwater level using universal Kriging: Journal of Earth System Science, 116, 49-55. Jolly, W.M., Graham, J.M., Michaelis, A., Nemani, R., and Running, S.W., 2005, A flexible, integrated system for generating meteorological surfaces derived from point sources across multiple geographic scales: environmental modelling & software, 20, 873–882. Kumar, V., 2007, Optimal contour mapping of groundwater levels using universal Kriging- a case study: Hydrological Sciences Journal, 52, 1038-1050. Nabi, A., Gallardo, A. H., and Ahmed, S., 2011, Optimization of a groundwater monitoring network for a sustainable development of the Maheshwaram catchment, India: Sustainability, 3: 396-409. Olea, R., and Davis, J., 1999a, Optimizing the High Plains aquifer water-level observation network: K.G.S. Open File Report. Olea, R., and Davis, J., 1999b, Sampling analysis and mapping of water levels in the High Plains aquifer of Kansas: K.G.S. Open File Report. Prakash, M., and Singh, V., 2000, Network design for groundwater monitoring. A case study: Environmental Geology, 39, 628-632. Hilip, R.D., and Kitanidis, P.K., 1989, Geostatistical estimation of hydraulic head gradients: Ground Water, 25, 672–678. Theodossiou, N., 1999, Evaluation of the distribution of hydraulic head in an aquifer using the Kriging method: Scientific Journal of the Hellenic Hydrotechnical Association- Hydrotechnika, 9, 3-14. Xu, C., Gong, L., Jiang, T., Chen, D., and Singh, V.P., 2006, Analysis of spatial distribution and temporal trend of reference evapotranspiration and pan evaporation in Changjiang (Yangtze River) catchment: Journal of Hydrology, 327, 81– 93. Yeh, M.S., Lin, Y.P., and Chang, L.C., 2006, Designing an optimal multivariate geostatistical groundwater quality monitoring network using factorial Kriging and genetic algorithms: Environmental Geology, 50, 101-121. Woldt, W., and Bogardi, I., 1992, Ground water monitoring network design using multiple criteria decision making and geostatistics: Journal of the American Water Resources Association, 28(1), 45-62. Wood, G., Oliver, M., and Webster, R., 1990, Estimating soil salinity by disjunctive Kriging: Soil Use and Management, 6, 97-104.